The Web Connection .NET and ISAPI modules include a built-in mechanism for hot swapping an existing COM server while the server is running. This mechanism allows updating of an executable on a live server without taking the server offline first a process which takes a few seconds at most. This process is automated via two separate HTTP links - one to upload the file and one to swap the servers. 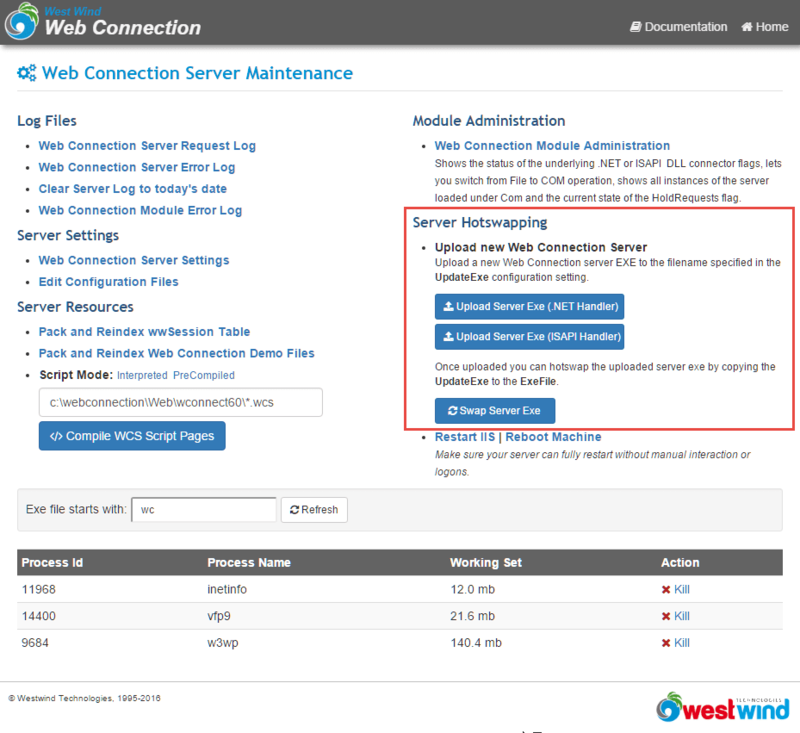 The process is automated and managed by two matching links in the Web Connection Administration API for interactive operation, or you can use the wwHttp class to automate the process programmatically. Click one of the Upload links to upload your updated EXE to the server. This is simply a file upload. This uses the Web Connection server to handle the upload. The ISAPI module doesn't support uploading directly, so this is offloaded to the Web Connection server. This function is built into both the .NET and ISAPI modules. It works reliably only in COM mode as it shuts down the COM objects, and then and copies the UpdateExe file to the ExeFile. It can also work in File Mode but all file servers have to be explicitly shut down. 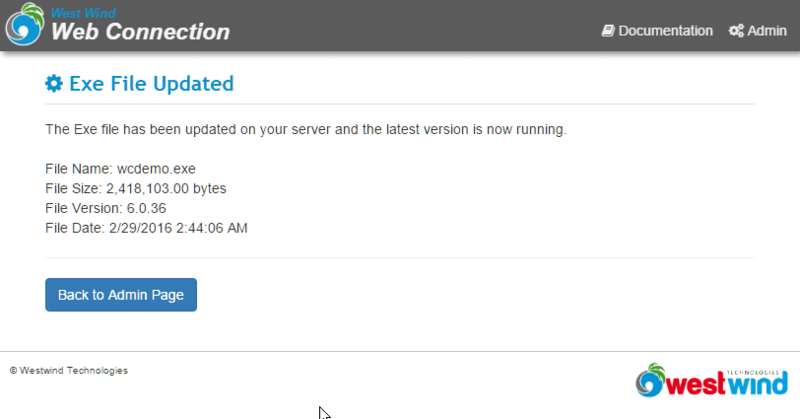 The process is controlled via the ExeFile and UpdateExe configuration settings in the web.config and wc.ini files. Note that the .ini version requires a full path, while the web.config version understands relative paths relative to the root web folder which makes the values more portable if moved. Once these values are set the manual upload process allows you to push a binary to the server, and hot swap it. When you create a new project Web Connection automatically builds a bld_yourProject.prg file that builds your server and creates a base template for uploading a new binary to the server. wait window nowait "Updating Exe File on Web Server..."
and uploads the local WebDemo.exe file to the server. This request hits your Web Connection server to actually capture the file and dump it to disk in webdemo_update.exe on the server. which hot-swaps the exe by shutting down the COM servers, putting the servers on hold, swapping the WebDemo_update.exe to WebDemo.exe, taking the servers off hold and then reloading servers. The latter HTTP result is captured and displayed for you. The server code against the .NET module reads out the new server's write date and version and echo's that back so you can see if the update worked.